This round serving tray is durable enough for everyday use and festive enough for your finest table or special occasion. It measures 12.5" in diameter (the round portion) and 13.25" across when you include the handles. This tray would make a wonderful cake plate or a baked bree at a party! Polish Pottery Strawberry Butterfly pattern is a great piece of art that has been crafted by master artisans from Zaklady Ceramiczne “Boleslawiec” to render this Polish stoneware a uniqueness of its own. The attractive depiction of blue-hued flowers in a scenic garden background where cheerful butterflies surround them from all sides help to create a wonderful display. This handcrafted Unikat stoneware can be put to varied uses without worrying about maintenance. The cobalt-blue rims are neatly complemented with a classic pattern, including multiple panels and a scalloped design to enhance the overall beauty of this Polish art pottery. 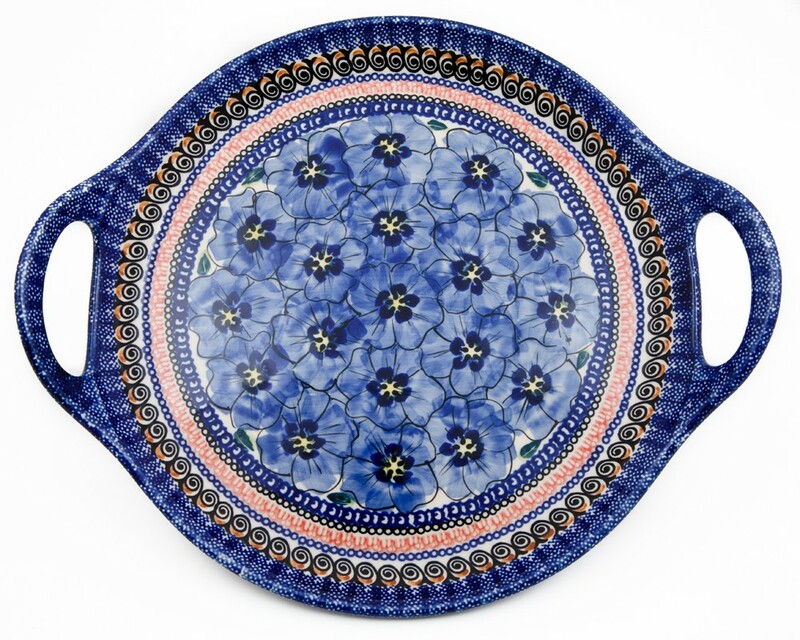 POTTERY AVENUE’S, BLUE PANSY Round Handled Tray from “Boleslawiec” brings alive the richness of classical art forms of Poland with the hand stamp technique used in the design. This “Boleslawiec” Pottery exhibits a round tray at the center and includes two handles with cut-out panels to assist easy handling. The glistening surface of this Polish art Stoneware enhances its charisma, making it a wonderful serving plate for cake and baked brie at your next family dinner or party. •• To insure longevity of your stoneware, it is recommended not to put the piece too close to the heat source such as the broiler or bottom of the oven. The exquisitely detailed BLUE PANSY UNIKAT Pattern is hand-painted in Poland following a 750-year tradition of artistry. Made by a skilled artisan. The complex modern design and use of colors of this Polish Stoneware add a warm, welcoming mood to your table. Tangerine orange flowers are surrounded by a host of green leaves and hues of blue, which is further framed by hand-stamped intricate patterns in shades of delightful colors.